Law aspirants always keep up finding new gateways to get closer to a lucrative law career. The DU LLB exam is the gateway to a 3 year LLB program offered by the Faculty of Law, Delhi University. It should be made clear to the law aspirants that this exam is only for getting admission in DU’s 3 year LLB program and not any other law institute. Delhi University is one of the most popular and prestigious universities in India. It offers a 3-year long law course that makes law aspirants the best lawyers. With the rising number of legal suits being filed each day, the demand for highly talented lawyers is increasing too. The university receives several thousands of applicants each year; hence to shortlist the best ones it organizes the DU LLB entrance test. Many students of our earlier coaching classes for DU Law entrance have successfully cleared the test in their first attempt only, and so can you. Law aspirants must have cleared their graduation with at least 50% marks. There is relaxation for OBC and SC/ST category concerning the eligibility criteria. The university tests applicants on Analytical Abilities, Legal Awareness, English, and General Knowledge. 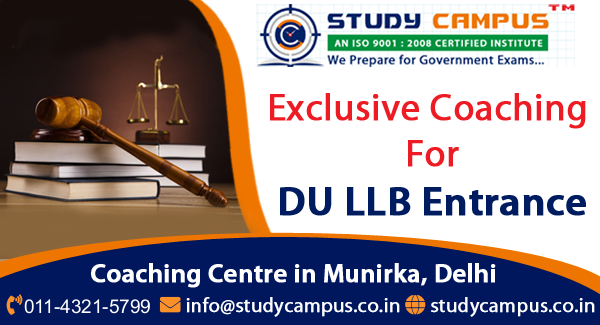 The exam pattern and syllabus are slightly different from the other law entrance examinations; hence it is advised that you take guidance from a reliable DU LLB entrance exam coaching in Munirka, Delhi. Having a trustworthy coaching institute by your side can help you prepare well enough to stay a step ahead of the other applicants. Please check below the tentative exam dates for DU LLB 2019 entrance exam. The Faculty of Law, Delhi University has limited number of seats to offer the law aspirants; hence they select students based on the marks obtained in the DU LLB entrance exam. By enrolling in our coaching classes located in South Delhi, you will be made aware of all the relevant information related to the exam, tips and tricks to clear the same, and much more in an easy to understand manner. The need for qualified and talented lawyers is increasing with every passing day. With so many laws in place, the companies need a reliable legal hand that can guide them through the intricate policies and solves their law-related problems. After clearing the DU LLB, you can either join a company or choose to pursue a master’s degree. For having greater opportunities, it is advised that you complete the masters too. If you have some questions in mind, then visit our DU LLB entrance coaching in Delhi today. This pen paper-based exam is conducted each year by the Faculty of Law, Delhi University and the difficulty of the paper stays quite high. We receive many inquiries from students living in areas like the Hauz Khas, JNU, Saket, Ber Sarai, Malviya Nagar, and many others regarding our DU LLB course. Our diligently prepared tutorial is crafted by top-notch industry experts, so you can rest assured of your preparations by joining our DU LLB entrance exam coaching in Munirka, Delhi.